Giddings & Lewis mdl. 340-T Horizontal Boring Mill s/n 150-253-57 w/ 110” x 48” x 60” Travels, 26” Quill Travel, Acu-Rite DRO, 10-1300 RPM, 4” Spindle, Power Feeds, 48” x 122” Table. Bridgeport Vertical Mill s/n 264127 w/ Sony Millman DRO, 2Hp Motor, 60-4200 Dial Change RPM, Power Drawbar, Chrome Ways, Power Feed, 9” x 42” Table. Bridgeport Series 1 – 2Hp Vertical Mill s/n 211078 w/ Anilam DRO, 60-4200 Dial Change RPM, Chrome Ways, 9” x 42” Table. Monarch mdl. EE Tool Makers Lathe s/n EE-45265 w/ 0-4000 Digitally Controlled RPM, Taper Attachment, Inch Threading, Tailstock, 5C Collet Closer, 6” 3-Jaw Chuck. Sharp mdl. 1760K 17” x 60” Gear Head Gap Bed Lathe s/n 74602 w/ 50-1800 RPM, Inch/mm Threading, 2” Thru Spindle Bore, Tailstock, Steadyand Follow Rests, Trava-Dial, 10” 3-Jaw Chuck, 12” 4-Jaw Chuck, 5C Collet Closer. Armstrong – Blum / Marvel Series 87A11PC CNC 18” Vertical Miter Band Saw s/n E-469111PC w/ Marvel Controls, Hydraulic Clamping and Feeds, Coolant, Conveyors. Armstrong – Blum / Marvel Series 8 MARK 1 18” Miter Vertical Band Saw s/n 823035-W w/ Manual Clamping, 45 Degree Miter, Coolant, Conveyor. MEP Type TIGER 350AX Automatic Miter Cold Saw s/n 006014 w/ Tiger AX PLC Controls, Auto Feeds, Pneumatic Clamping, Conveyors. Allison “Sever-All” mdl. 2-B 20” Abrasive Cutoff Saw. DoAll “Metal Master” 36” Vertical Band Saw w/ Blade Welder. 1997 Haas VF-10 4-Axis CNC Vertical Machining Center s/n 9759 w/ Haas Controls, 20-Station ATC, CAT-40 Taper Spindle, 10,000 RPM, Thru Spindle Coolant, 120” x 31” x 30” Travels, Hand Wheel, Brushless Servos, Programmable Coolant Nozzle, Quick Code, Rigid Tapping, Chip Auger, Coolant. 1996 Haas VF-9 4-Axis CNC Vertical Machining Center s/n 8936 w/ Haas Controls, 20-Station ATC, CAT-40 Taper Spindle, 7500 RPM, Thru Spindle Coolant, Brushless Servos, Programmable Coolant Nozzle, Quick Code, Rigid Tapping, Chip Auger, 36” x 84” Table, 40” x 85” Aluminum Top Plate, Coolant. 1997 Haas VF-2 4-Axis CNC Vertical Machining Center s/n 9963 w/ Haas Controls, 20-Station ATC, CAT-40 Taper Spindle, 7500 RPM, Brushless Servos, Quick Code, Rigid Tapping, Programmable Coolant Nozzle, Chip Auger, Coolant. Mori Seiki MV-80 CNC Vertical Machining Center s/n 287 w/ Fanuc System 11M Controls, 40-Station ATC, BT-50 Taper Spindle, 3500 RPM, Hand Wheel, Chip Auger, Coolant. Bridgeport / EZ Trak 2-Axis CNC Vertical Mill s/n 271473E w/ EZ-Trak DX Controls, 2Hp Motor, 60-4200 Dial Change RPM, Power Drawbar, Chrome Ways, Power Knee, 9” x 48” Table. Axxiom mdl. 4.5CF Garnet Hopper. 1998 Bystronic “By Sprint 2512.2” 2-Pallet CNC Laser Contour Cutting Machine s/n 60 w/ Bystronic Controls, 6-Pallet Shuttle System, 50” x 122” Pallets, Bystronic Automatic Vacuum Sheet Loading System, Bystronic Laser BTL1800 1800 Watt Laser Source, Koolant Koolers Cooling Unit. 1995 Bystronic BYSTAR 3015 2-Pallet CNC Laser Contour Cutting Machine s/n 341 w/ Bystronic Controls, 5’ x 10’ Cap, Bystronic Automatic Vacuum Sheet Loading System, Rotary Tube Option with 12” 4-Jaw Chuck and 5 ¾” Thru Bore, Bystronic Laser BTL2800 Turbo 2800 Watt Laser Source, Koolant Koolers Cooling System, Lazervac 2442 Dust Collection System. 2006 Accurpress mdl. 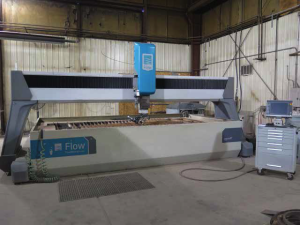 740024 400 Ton x 24’ CNC Hydraulic Press Brake s/n 8724 w/ Accurpress ETS Pedestal Controls, 24’ Bed Length, 20’ Between Uprights, 10 ¼” Throat. AFM mdl. EP13-220 220 Ton x 13’ CNC Hydraulic Press Brake s/n CHPB/9-71439 w/ PC800 Controlled Back Gaging, 13’4” Bed Length, 135 ½” Between Uprights, 16” Throat.